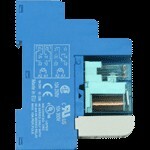 Model 57016: Coupling relay 2x changeover 230V: 2 x changeover for DIN rail mount. Sending alarms over the network via e-mail, SNMP trap, etc. as well as locally using switching contacts. Self-refreshing status report for alarms including acknowledgment from the browser. The complete solution for autonomous, decentralized monitoring with integrated data logging.